Petite desk/table with blue leather inset in the top. 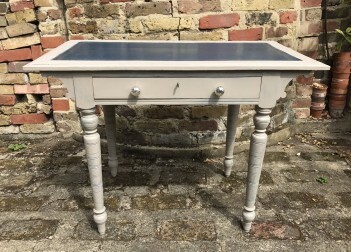 The table has been painted in Grand Illusions Vintage Paint firstly in Gustavian Blue and then in Mousse which has then been sanded back to reveal some of the blue colour coming through. The table has then been waxed and new handles have been added to the drawer.